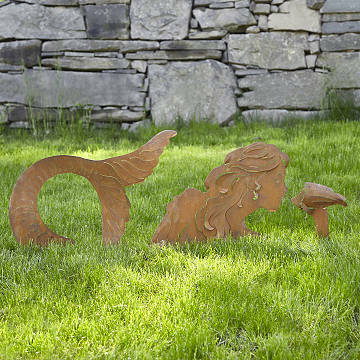 Made from hand-cut steel, this mermaid silhouette appears to swim through your lawn or garden. Make a splash in your garden or lawn with this alluring mermaid. Originating far from the sea, she is handcrafted from industrial steel by artist Chris Crooks at his studio in the Santa Rita Mountains of Arizona. The mythic beauty, who seems poised to sound a note on her conch shell, is given the aged, rust-red patina of an undersea treasure. You can position her three sections to create the illusion that she is swimming through your landscape, and the included, 6" metal stakes keep her securely anchored. Handmade in Tucson, Arizona. No special care needed however, patina will darken over time. I used this infront of a fence and planted snow in summer and aubretia as a mass of ground cover. I think this is a good size and quality for what it is. Excited to give it to the recipient for Christmas and see how it does once it's set and has had time to rust/become weathered. With time I think it will look excellent in a wonderfully maintained garden after it's had time to sit out in the elements. Love my Mermaid Lawn Sculpture! She looks terrific around the pool. I purchased this for a friend and put it in her front yard. Our new mermaid makes a beautiful accent against a fishing pier. I did have to paint it because our salty ocean air will undoubtedly rust her much quicker than most environments. It is exactly as pictured. She's our 2nd. Gave one to a friend for a birthday, and we all admired her so much I needed one to swim next to our pool. Very stable, don't need to worry about wind. Very well packaged and delivered as promised, with a nice card describing the artist who created her. Nice addition to the garden. I have decided to put her in a planter box. She looks very pretty there. I was a little disappointed with the shipping in that she arrived somewhat bent out of shape and she is already rusted. I was expecting her to look like the picture and thought she would patina with age in my garden, rather than arrive looking like she had sat out in the rain already.